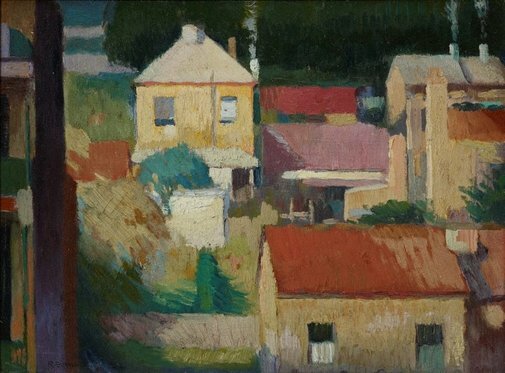 Roland Wakelin is an artist whose name has become synonymous with early Sydney modernism. Between the years of 1915-1920, he formed part of a loose coalition of young artists who began experimenting with new forms of colour painting and streamlined design in a desire to create works that were aligned with the modernity of their harbour metropolis. By 1919 Wakelin was working closely with Roy De Maistre and both produced works imaging local scenes that were intensely coloured, radically simplified and anti naturalistic. The pair held the exhibition 'Colour in art' in 1919 that has become renowned as the first exhibition of Australian modernism. 'Colour in art' showcased works that were informed by European and American theories of modernism while responding to the local conditions of the artists' city and its light-filled harbour. 'The yellow house' is indicative of Wakelin's exploration of modern colour that culminated in the seminal 'Colour in art' show. Indeed, the work beautifully demonstrates Wakelin's capacity as a bourgeoning modern colourist, with a palette of yellow and red hues that are subtly counterbalanced by purple and green accents. The yellow house too reveals Wakelin's appreciation of Cézanne's art, from which he took the idea of underlying structure in painting and using colour as central to the mechanics of composition. 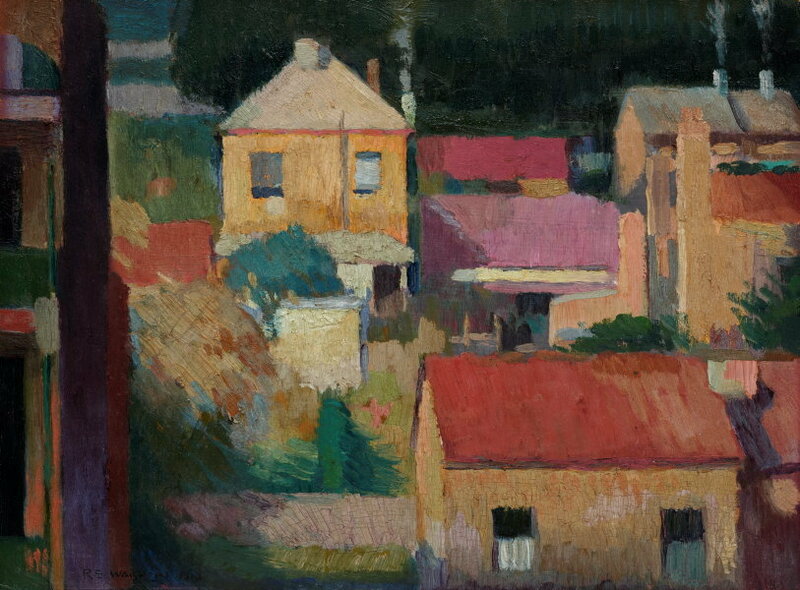 First exhibited at the Royal Art Society in 1918, this small work encapsulates the elements of the aesthetic transformations that were central in formulating Australian modernist culture; of flattened perspective, radically reduced design and activating vital, saturated colour as key to modern painterly expression. Signed and dated l.l., black oil "R.S.WAKELIN 1918". Deborah Clark, Sydney moderns: art for a new world , 'Roland Wakelin: the early years', pg. 42-45, Sydney, 2013, 43 (colour illus. ), 317. Denise Mimmocchi, Look , 'New to the collection: building up our holding of Sydney moderns', pg. 15-17, Sydney, Dec 2014-Jan 2015, 16, 17 (colour illus. ).